The Lake Country Purple Foamed Wool Polishing Pad is one of the newest pads that helps you get even more cutting power when polishing. Traditional wool pads provide exceptional cutting power but tend to give off a lot of lint and can be challenging to work with due to their natural variation. 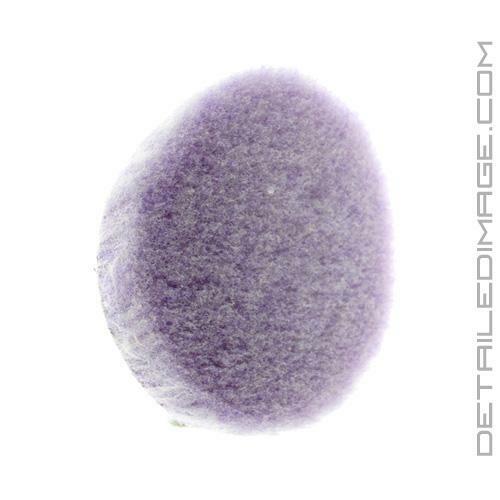 The Lake Country Purple Foamed Wool Pad is a break through product that gives you outstanding cutting power with greatly improved ease of use. This pad will give you more cutting power than a yellow foam cutting pad, without the harmful downsides of traditional wool pads. The patented nanofoam process encapsulates the base of the lambswool fibers with microscopic polyfoam particles. This type of pad and it's manufacturing process gives you several major benefits for better results in less time. The most obvious is the outstanding cutting power that allows you to remove up to 1500 grit scratches while leaving no haze or micro-scratches behind. The foam base holds the wool fibers tightly in place to minimize lint, unlike natural wool pads. This also helps keep even spacing between the wool fibers so they do not lot too flat or tight together. Increased spacing allows more air to remain between the fibers which improves cushioning and retention of polishes and compounds. This pad is ideally used with a Flex or rotary buffer for best results and it has a centering hole in the pad. Rotaries users will want to use a centering post to ensure the pad is centered just like regular foam pads. Get more cutting power with one of the most technologically advanced pads on the market! Love these pads, they work well with Essence on a DA. As a DIY, used it on a Boxster to further correct with M105 after the orange pad only corrected 75%. Followed with Mersena 3800 with blk pad and it's much more acceptable. Took 95% scratches off.